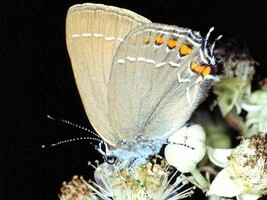 A mainly holarctic group of hairstreaks, with some representatives in subtropical Asia. There are a number of names associated with taxa from Taiwan and China which are not listed here because their status cannot be ascertained. There are a vast number of generic names associated with Satyrium, in part because of Tutt's publication of numerous homonyms which have spawned replacement names that are now for the most part viewed as synonyms. The circumscription adopted here is that of Robbins (2004). Tuzov et al. (2000) recognize Neolycaena, Nordmannia, Superflua and Armenia as valid genera for temperate Asian forms. 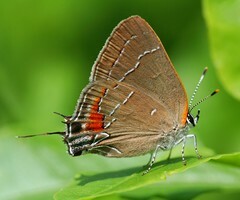 Page: Tree of Life Satyrium Scudder 1876. Authored by Andrew V. Z. Brower. The TEXT of this page is licensed under the Creative Commons Attribution License - Version 3.0. Note that images and other media featured on this page are each governed by their own license, and they may or may not be available for reuse. Click on an image or a media link to access the media data window, which provides the relevant licensing information. For the general terms and conditions of ToL material reuse and redistribution, please see the Tree of Life Copyright Policies.